Editor’s Notes: PAP not only hogs “talent” from the Union, it also hogs “talents” from Civil Service and Uniform Groups. How often do you see these “talents” joining the Opposition Parties? Other than joining Opposition Parties often means near-zero chance of the being elected, why fight against the tide and lose out on a promising career joining PAP and potential million dollar pay cheque as ministers (such as BG Lee Hsien Loong, BG George Yeo, RADM Teo Chee Hian, RADM Lui Tuck Yew). These are some of the main reasons why Opposition parties can never do well despite they try and try very hard. It is like mission impossible….. THE outgoing Chief of Army, widely tipped to enter politics, pledged yesterday to continue serving the nation in whatever capacity he may be called upon.Major-General Chan Chun Sing, who held the post for a year, handed over command to Brigadier-General Ravinder Singh at a full-regalia parade.Although the Defence Ministry did not say where Maj-Gen Chan, 41, would be headed next, those who know him well say he is trading his green fatigues for the white-on-white garb of the People’s Action Party.If he does contest the coming general election as a PAP candidate, he will be among the highest-ranking Singapore Armed Forces officers to join the party.He is one of two army generals who stepped down from their military posts yesterday.The other was BG Tan Chuan-Jin, 42, who is retiring from the SAF after 24 years in service. Civil service high flier Lawrence Wong, who is widely tipped to be a PAP candidate, will be stepping down as the CEO of Energy Market Authority (EMA) on Thursday. Mr Wong joins a number of other public service high-fliers tipped to be future candidates (of PAP). 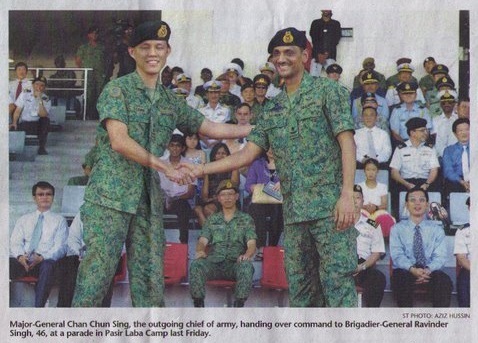 They include Major General Chan Chun Sing 41, who stepped down as Chief of Army on Friday, and Brigadier-General Tan Chuan Jin 42, who retired from SAF on the same day. Another former Workforce Development Agency Chief executive Ong Ye Kung 41, has already been introudced as a PAP candidate. Should politicians be parachuted in and become a minister and a politician? “The civil sevice does not allow members of its elite administrative Services and Military personnels to take part in political activities until they have resign and complete serving their notice”, so to overcome this restrictions, they retire or resign first and then vola they suddenly become politicians without having served in the grassroots at all, I call this political parachuting the Singapore style. The examples in the GE 2011 election are Lawrence Wong (CEO of EMA), Heng Swee Keat (MD of central bank MAS), BG Tan Chuan-Jin (the commander of the army’s Training and Doctrine Command), MG Chan Chun Sing (Chief of Army). Maj-Gen Chan has been chief of army for only a year. All the four are former prestigious scholarship holders and the so-called elites in Singapore. ‹ Pork-Barrel Politics in Singapore?